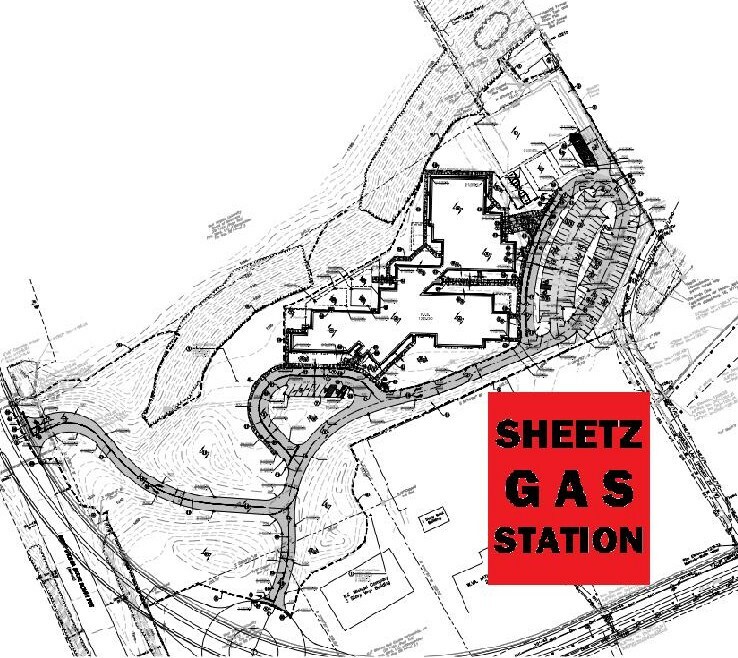 See the early Sheetz gas station planning below. Sheetz has been eager to buy land by the school on the Mileground. Sheetz would like a new traffic signal on the Mileground by its gas station as indicated below. And Sheetz would like a school drive to go immediately beside a station as also indicated below. Sheetz could start with the six pumps as indicated below, then expand to fill the entire armory site. Mon Schools does not own or control access/egress directly off the roundabout, so Sheetz could buy whatever is left of the R.E. Michaels property to put in a drive to its gas station off the “school” roundabout spoke, thus mixing ever more gas station traffic directly with school bus and car traffic, and allowing Sheetz to build a monster gas station off that major commuter and commercial intersection. That’s what happens when you build in unstable, high traffic, commuter and commercial sites: uncontrollable major development. This not unlikely possibility is yet another damning way in which the school site is grossly negligent: the future development of the site surrounds are likely to be intense in ways that are neither healthy nor safe for school children. Even the multiple highway and intersection expansions, long since prioritized, may not be the least of it. Sites with surrounds that cannot be known are grossly negligent. Sites with surrounds that are unsafe and unhealthy in ways that are both projected and expected to dramatically worsen are even more unconscionable. So it is with Mon Schools and its rash and wild, wrongful actions. See the FOIA release emails below. 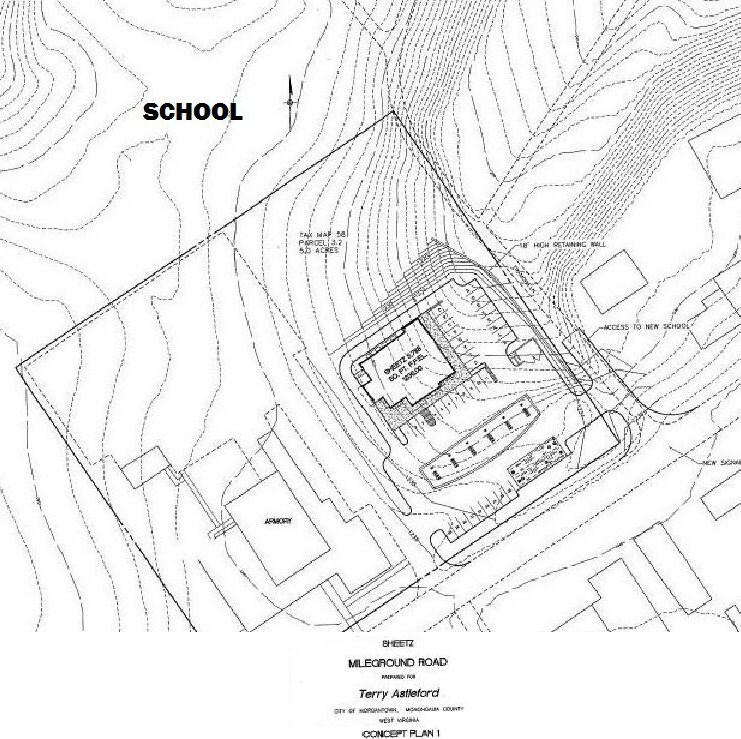 FOIA release (below) from WVU showing Sheetz’ early interest in a dual school/gas station drive, at the corner WVU parcel (above). 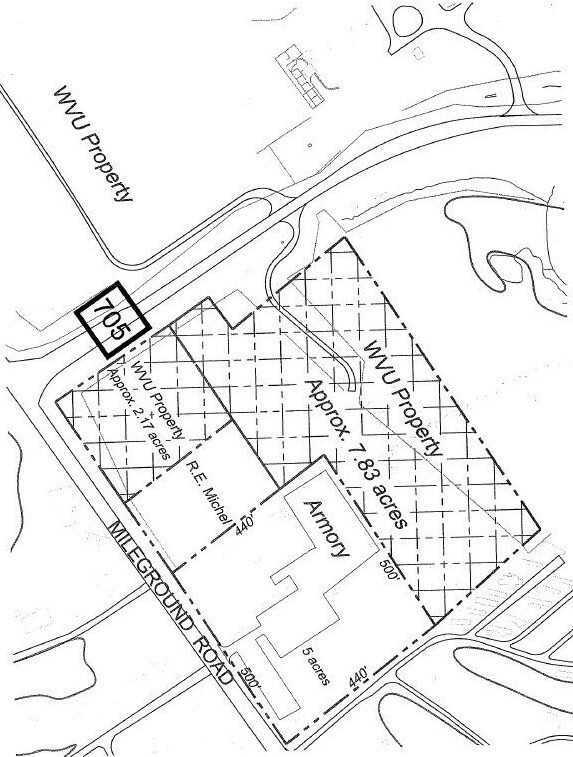 After WV DOH planned to put the 705/119 intersection on that corner WVU parcel, Sheetz shifted its interest and plans to the armory site. However, this still leaves a dual access possible from the intersection: school/gas station access, “a combined entrance” (see below). 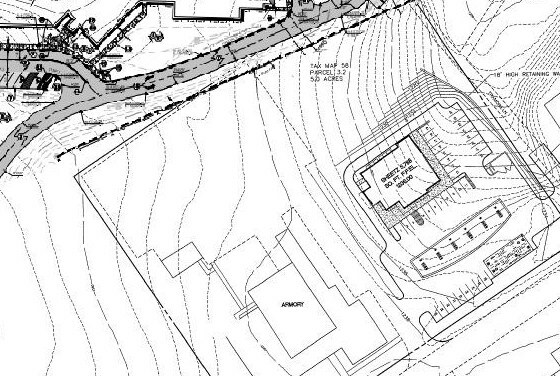 Why would Sheetz not want that direct access from the intersection to an armory gas station? In fact Sheetz would need such access to allow traffic from both sides of the impending divided highway to reach a gas station at the armory site. See, below, part of our Freedom of Information Act request of the WV Division of Highways. I can coordinate this project for DOH. Sheetz’ rep can contact me. Thanks. This one is proposed for the Mileground adjacent to the existing Armory away from the intersection with 705. (Sorry, I have a plan view, but apparently our scanner isn’t working because I’m not getting anything from it). As you’ll recall from the mtg. last week, once the Armory gets their new property over at the Airport this property will likely be put up for sale by the City and Sheetz wants it. The fellow we met with from Sheetz inquired about a signal at the proposed intersection, but I don’t see how that can be possible with all the emphasis being placed on improving traffic flow through this area. Do you want me to do the same thing with this one and just let them know to contact you on this project? I imagine DD and DT will have a lot to say about this one. Mickey and I met with Dr. Devono last week to discuss my interest in the 2.17 acre parcel at the intersection of Mileground Road and Rte 705. Dr. Devono was a gracious host as he took time to explain the school district’s plan to acquire the rear portion of the Mileground parcel for the development of a campus for the pre-K to K-5 student body. As I remained interested in the 2.17 acre parcel, I suggest that a meeting be arranged for all interested parties. From my side, I would like to have represented my tenant; Sheetz, my engineer and my legal counsel. I suggest these participants so that I clearly understand the procedure for acquisition of the corner parcel. Also, my tenant has an expectation of their presentation at the site. Bringing everyone together will eliminate confusion and misunderstandings in the future. Please let me know when you are available in the next few weeks. Possibly we can meet at your office or possibly I can impose on Dr. Devono to let us meet at his office. Give me several dates and times that you are available and I will coordinate a date and time agreeable to all.